Sentinel Clutch Head Screws, are easy to use thanks to their posidrive style drive head, saving you time and money through faster installations. They can be installed with posidrive type powered or handheld screwdrivers, but once installed are almost impossible to remove without drilling them out. 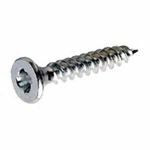 These security screws are a favourite with installers as they are quick and easy to install thanks to the posidrive head format. Sentinel Clutch Head Screws work in a similar way to the standard One Way Clutch Head screw, but feature a Posidrive type recess, making them suitable for use with a standard Phillips type screwdriver ...or even with powered screwdrivers. The posidrive head format of Sentinel Screws makes them quicker and easier to use than the standard slotted clutch head screw, which more than compensates for the slightly higher cost of the screws when compared to standard Clutch Heads. No special security tooling required.